Political parties have failed to agree on a schedule for this month’s parliamentary extraordinary session as of Sunday, with Liberty Korea Party objecting to Constitutional Court Justice nominee Lee Mi-sun, raising concerns the National Assembly may fail to take swift action on key bills. During last month’s extraordinary session, the parties agreed to fast-track 10 key bills, but they remained deadlocked over details regarding electoral reforms and an independent investigative agency. The latest standoff over Lee’s nomination has raised concerns the April session could end without addressing pending bills, such as a revision of the flexible working hours system, minimum wage and three kindergarten-related laws. Cheong Wa Dae nominated former judge Lee for the Constitutional Court justice post because of her background as a “nonmainstream” judge with expertise in labor law. 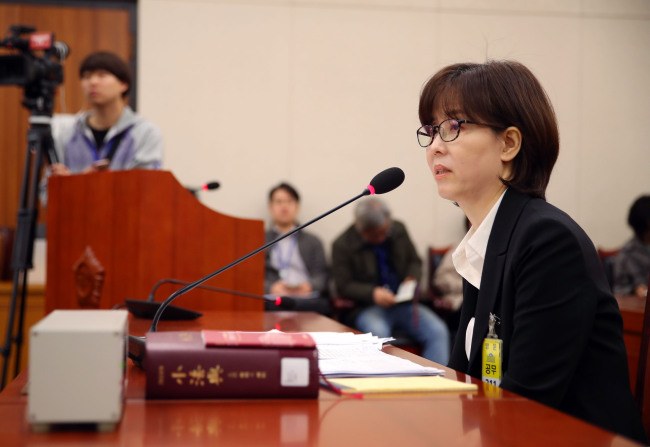 But she and her husband Oh Cheong-jin’s long list of stock investments spanning over 5,500 transactions sparked controversy during the confirmation hearing last week. Stocks worth 3.5 billion won ($3 million) held by her and Oh, a former judge at the Busan District Court, accounted for 83 percent of their assets amounting to 4.06 billion won. The ruling Democratic Party has defended her by saying there was no illegal trading, and therefore she is eligible for the job and point out that she sold all her stocks last week after the hearing. But the opposition alleges that the couple had access to insider information. Although the shares were traded under both their names, they maintain it was Oh who did the actual transactions and Lee was not involved. The ruling party added that Oh also plans to sell his stocks in the future. “We believe there were no problems in the process of trading stocks. Owning a large number of stocks should not be an issue,” said Hong Ik-pyo, spokesman of the Democratic Party. “Lee has already sold her stocks. We should wait for the financial authorities to look into allegations surrounding her stock investments,” Hong added. Maintaining a tough stance, the Liberty Korea Party said it would approach the Supreme Prosecutors Office and file charges for violation of the Corruption Prevention Act and Capital Market Act, and leaking official secrets. While urging Lee to step down due to a “conflict of interest,” the Liberty Korea Party continued to pressure Cheong Wa Dae to reshuffle its officials in charge of human resources for nominating “unqualified” individuals. Along with the minor opposition Bareunmirae Party, it plans to jointly file a petition with the financial authorities to investigate the couple’s stock transactions. Before Lee sold her shares of eTech E&C and Glasslock -- affiliates of local energy and chemical group OCI -- they accounted for 67 percent of all stocks owned by the couple. Opposition parties have alleged there was a conflict of interest, as Lee had tried a case involving OCI as a witness and Oh was a judge in a trial involving the group. She has vehemently denied the allegations. Tension at the National Assembly is expected to escalate if President Moon Jae-in requests the National Assembly to adopt a report on Lee’s confirmation. The opposition parties have slammed Cheong Wa Dae for appointing Minister of SMEs and Startups Park Young-sun and Unification Minister Kim Yeon-chul despite their opposition.